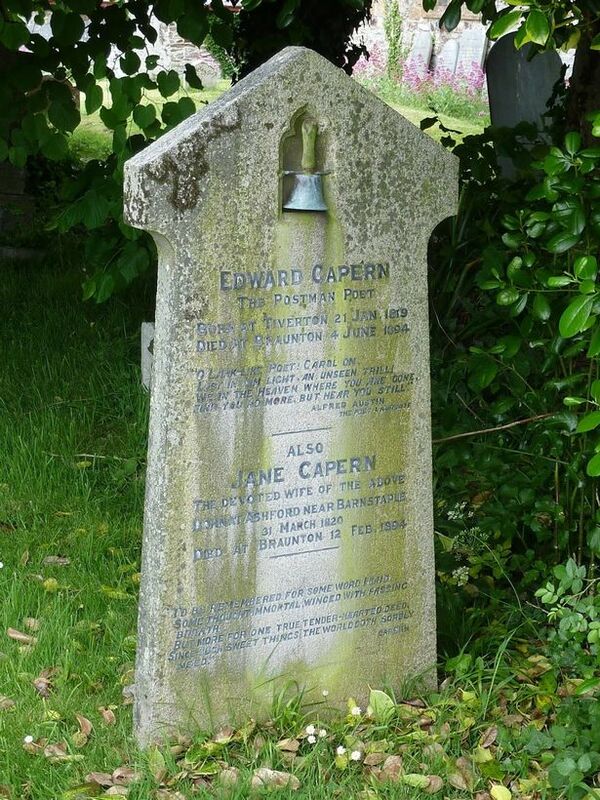 On January 21 1819, Edward Capern, Devon’s Postman Poet, was born into a poor, working-class family in Tiverton. His father, a baker, could not afford to educate his son and would never have dreamt that he would become nationally renowned as a poet, winning plaudits from the Prime Minister and support from the biggest literary names of the day. The bicentenary of his birth would, perhaps, have gone unnoticed if his extraordinary story had not been brought back to public attention by Devon author Liz Shakespeare. She has written The Postman Poet , a novel based on the life of Capern, and has published 34 of his 600 poems in The Poems of Edward Capern . While writing the novel, Liz drew on historical research and details in the poems to tell the astonishing story through Edward’s eyes as he struggles to support his family, capturing the opportunities and inequalities of Victorian North Devon. “He had to ask the recipients if he could keep the envelopes because he’d written poems on them,” said Liz Shakespeare, whose own cottage was on Capern’s round. She added: “He was entirely self-taught but he had a local benefactor, William Frederick Rock from Barnstaple, who saw Capern’s early poems in the North Devon Journal in the 1850s and supported the publication of the first volume of poems. Edward Capern was awarded a Civil List Pension by the Prime Minister for his services to literature and went on to write three further books of poems. During her research, Liz found that some of his poems were intended to be sung, so collaborated with Devon musicians Nick Wyke and Becki Driscoll who set them to music for their CD, The Songs of Edward Capern . One poem Nick and Becki have set to music is The Dinner Bell , a tale of the haves and have-nots in which Capern laments the plight of families who could hear the sound of distant dinner bells but had no food themselves. In recognition of Capern’s commitment to social justice, £1 from each copy of the poetry collection sold is being donated to the Northern Devon Food Bank, and more than £500 has been raised so far. Together, Liz Shakespeare, Nick Wyke and Becki Driscoll have appeared at music festivals and book festivals to tell the story of Edward Capern through words and song. On Monday January 21 Liz placed flowers on Edward Capern’s grave in Heanton Punchardon to commemorate the birth of Devon’s Postman Poet two hundred years ago.